One thing that interesting about baby blogging, is that it makes it very clear just how quickly babies change. Last Sunday I blogged that Evan pulled himself to standing for the first time and was so impressed. He does it all the time now, it's 'old news' and if I didn't go back and read my post it would have felt that he has been doing this for weeks. He has even mastered putting one hand down to let himself sit back down instead of careening backwards. Not that he doesn't still have some spectacular tumbles. I want to get him a tee shirt that I saw that says 'I do my own stunts'. Will and Lily are now pulling themselves to knees. Will loves to go exploring, crawling rather quickly across the den, through our bedroom and into the bathroom. The bathroom floor makes fun sounds when you smack it. Lily can move easily from crawling to sitting and has lots of interesting yoga moves. Evan was standing in his crib when we went to go get him after his nap this morning. Will has been saying Dada for a couple of weeks now and hasn't stopped - and I thought he would be the last to start talking. Lily started making a bunch of new sounds just yesterday, including Da, La, Ba, Blah. Evan is in a squealing stage, he is loud and loving life. Check out the links to some triplet blogs from my same age triplet group (see right hand of page). We just got home from a fun filled day at Grammy and Papa's house. Uncle Jason and my Dad came too. We swam in the pool, the kids are water bugs, they love it. Afterwards we hung out and grilled steaks. We fed the babies dinner in the new booster chairs David's parents bought. It worked well, afterwards we put them in PJs and let them play a bit before heading home. By the time we got home, Evan and Lily were crashed out. Everyone went down fairly easily. Lily fussed a bit going to bed which is very unusual for her. Last night we were up at 10pm, 1am, 3am and 5am with her. Well, 'us' until the 1am episode, then David and Jo, our girl cat, hightailed it upstairs to get some decent sleep. It was fine by me, I got the whole bed to myself to stretch out. Lily is normally a great sleeper so I was pretty concerned about her. Poor little bug, she has a bit of a cold and was also having stomach pains. It has been making her miserable. She still laughed and had a great time today, even with a runny nose, what a sweetie. I've been trying to use sign language but haven't been very consistent. We've been focusing on 'milk', 'thank you', 'please', 'more' and 'all done'. I have no idea if they are getting any of this. From what I've read, sign language is a great way to ease frustration over trying to communicate as babies develop their language skills. Speaking of languages, Mayela also speaks to them predominately in Spanish. I have no real basis for this, but I think they understand her. I'm inferring this just from their expressions. It would be a great gift to have them learn two languages very early in age. 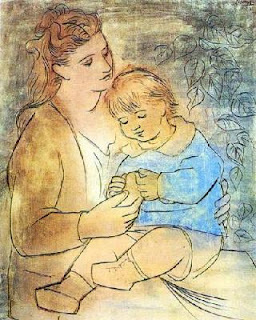 From what I have read, multiples start talking later, and children that learn more than one language start talking later. So, I'm aware that it may cause some delays, or seem like they are delayed. Apparently, when bilingual kids do start talking, they can master both languages and catch up quickly. Same with multiples, they don't feel the same need to talk because they have their own special language, but when they do talk they do just fine. Interestingly enough, studies show that boy multiples tend to have more of a delay, while girl multiples are often ahead of singletons. Hmm. Here we are reading some of the cool spanish children's books Mayela bought the babies. 5:00am: Will wakes hungry, give him a bottle and a clean diaper then back to bed. 6:30 am: Rise and shine, everyone is all smiles. First bottle of the day, followed by play time in the den. We listen to music, 'Kings of Convenience' this morning. We’ve blocked off the den with their toy baskets, which we hope will hold them off for a bit longer. The rest of the den is baby proofed so we let them crawl around and explore. Evan and Lily are still mostly commando crawling, but starting to try out different techniques. Will is crawling on hands and knees. They are fast. We try a couple races to toys, Evan and Will are neck and neck, Lily gets distracted and goes off in her own direction. Evan pulled himself to standing using the book basket. First time, wow! 7:30am: David and I pack everyone up and head to Pacha for coffee and some breakfast. Babies are very good hanging out in the baby jogger, playing with their toys and having some bites of apricot and pear baby food. 10:30am: Time for second bottle, followed by lunch of mac and cheese, peas, puffs and sweet potato. Everyone has food in their hair and on their clothes, including me and David. David and I have lunch and watch the babies play in the den. 1:30pm: We pack up the car and transfer the kids to their car seats for the remainder of the nap. Off to Grammy and Papa's house. 2:00pm: Afternoon bottles, then we hit the pool. Babies love the pool, even though it was a bit chilly today. They each have their own yellow round float but also like being held so they can practice swim, kicking and laughing and trying to put their face in the water. 3:30pm: Put babies in warm dry clothing, they crawl around the living room while we grill and hang out. Lily does her 'yoga' routine. She stretches out one leg, then the other, then does downward dog with her but up in the air and straight legs. I think it is her ‘safe’ way of practicing standing. She finishes with a split. Very nice. 4:30pm: Babies in PJs, dinner bottles and we head home. Babies are all asleep in their carseats by the time we arrive home. 5:00pm: Babies are sleepy so we just give them more milk instead of a full dinner and they are off to bed. Will and Lily crash out. Evan has a second wind of energy so we sit on the front porch together with David. Or rather, I try to keep Evan from nosediving off of the chair into the potted plant and from eating the leaves from the bush nearby, while catching up on conversation with David and having a glass of wine. 6:00pm: Evan finally goes down. 7:00pm: Hang out with Uncle Jason, we watch sunday Sopranos and Entourage and call it a night. Brian was out of town so we wil save the shows on our dvr. The Governor signed the bill today and the Texas TwinBill is now a law. From what I gather, this law will let parents make the decision whether their multiples should be in the same class or different classes. Prior to this law, it was up to the school and typically schools have rules to separate multiples into different classrooms. Apparently, this is a big hot button for multiples moms. They want equality for multiples, horray! And they want to keep their multiples together. Honestly, I don't get why it is such a big deal. Ask me again in five years. I'm sure I will have a strong opinion then. Pro: Now this is a big one....one teacher, one syllabus, one set of homework assignments. Woohoo! This would rock. How will I possibly help each of my children with their homework every night and help them keep up with all the projects, etc if they are in different classes. I've heard that the amount of homework for young kids these days is absurd. Ok, so it's not just about me. Cons: Other kids have to leave their parents, and this is hard. They go off into the big world and are in class by themselves. Why not multiples too? Do they really need their siblings there? Wouldn't it be sending a message that we do not trust them to be able to do it on their own? Again, I say this with a BIG caveat, that I have no idea how multiples interact, their special relationship or what it would mean to separate them. Anyway, I have a feeling that my position will change over the years. Just because most the multiples moms I know don't want to separate their kids, at least not in the first few grades. Read more about the new Twin Legislation here. Things were looking up for Hedwig. His mother showed up and kept a close eye on him. He climbed a tree and successfully flew from one branch to another. Upon another try he landed back in one of our bushes where he spent the night. The next morning we found him on our neighbor's mailbox. We were outside and saw that there were workers showing up at that house to paint, so I showed them the bird and asked that they take special care. We went out to the store and when we returned, Hedwig was dead. In his brief life, Hedwig made it to the world wide web, and brought a smile to many faces. He was loved. Goodbye Hedwig. Spring is here, and the baby owls are back. This little guy, an eastern screech owl (Megascops asio), landed in a bush outside our front window. Apparently, this is part of the natural process where the young birds leave the nest to test their wings. Hopefully the mom can find him there. We will be keeping the cats in for the next few days and keeping our eyes out for other owlets. Want your own owl? Check out owlshack.com. Memo is the first one to crawl – arms and knees. Good style points. Crawled all the way into the dining room to go gnaw on my power cord. I used my powers of distraction to get him focused on a safer and more intellectual activity. He is now chewing on some books. Funny, how he was the last to scoot, but surpased Lily and Evan, going straight to crawling. It is interesting to see them each develop in their own unique way. There is no race, but it is fun to celebrate these little milestones. Memo also sprouted a new tooth today! Appologies in advance, but I feel compelled to anounce each tooth, at least until Lily get's her bottom two teeth. 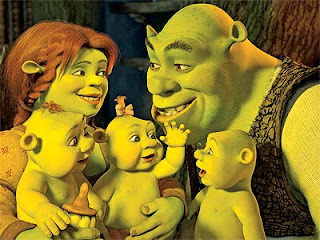 Shrek becomes a dad, three times over, in Shrek the Third opening on May 18th. Two boys and a girl! Remind you of anyone? Check out the photo gallery on people.com. Memo got his first little white tip of a tooth on Friday. Very exciting! We now have three teeth between the bunch. No teeth for Lily yet. I think Scabbers is making him feel better. Evan is a chatter bug saying Dada and just since Sunday, Mama. Lily isn't really saying any words but has lots of vocalizations. Will still doesn't say much. The doctor had said that we would have to get him away from the other's to talk because he won't if everyone else is talking. I worked with him a bit this weekend. He laugh is a quiet 'hu hu'. So we practiced saying 'hey!' and he finally got it. It is so cute, because now he will say 'hey' when I walk by to grab my attention. I try to pick him up and give him lots of attention when he says it so he will want to communicate more. Lily is mastering her scooting ability. She can really get around. Last weekend I was paying attention to Will and had my sandwich on a plate on the floor next to me. In a flash she had scooted right over, grabbed the sandwich with two hands and put it in her mouth. Evan is starting to crawl, but backwards. That can cause some frustration, he will want a toy and end up going the wrong direction. Will is pretty comfortable sitting up now, although he did have a tumble the other day and hit his cheek on his baby keyboard. Poor thing. We also tried some finger foods, those Gerber puffs and sliced banana. As soon as I put them on their trays, Will picked a puff up and put it in his mouth. Evan and Lily eventually figured it out too. It made a mess but they enjoyed having some independence and it keep them occupied between spoonfuls during the rest of dinner.